Pittsburgh native Mimi Gula traces her interest in art to her childhood. Growing up in the formerly smoggy hills of the Steel City, art became a way to both reflect and escape reality. Focusing primarily on color and design, she won recognition at some of the area’s leading art schools: St. Joseph’s Art Academy, Carnegie Mellon and the Art Institute of Pittsburgh. As an adult, she moved with her husband and their two sons to a scenic mountain community in Pennsylvania’s rural Somerset County. Mimi continued to experiment with many mediums while working full time at an office job. She eventually returned to school to update her skills, earning a degree in Commercial Art and Design. 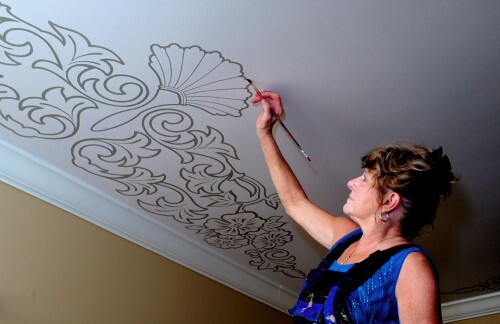 In 1994, she opened Designed Impressions, specializing in commissioned art, murals, trompe l’oiel, faux finishes including plasters, and custom framing. In 2001, Mimi relocated to South Carolina. She now lives in Murrells Inlet, where she has resumed her business in the Grand Strand area. As a member of International Decorative Artisans League, Mimi attends an annual convention to update her skills and familiarize herself with the latest trends. She is also a member of the Waccamaw Arts & Crafts Guild, and a former member of the Somerset County Artists Association and the Laurel Arts/Dressler Center.